Imarpig. In my Yup'ik language, this means the big water, the ocean. This is the Bering Sea. It is where our stories come from and how we have survived since time immemorial. Almost everything our bodies need comes from the ocean – seal, whale, walrus, birds, fish and shellfish species. These are traditional foods, and are a foundation of our village economies. The Bering Sea Elders Group, where I serve as chair, consists of delegates from 39 coastal tribes from Kuskokwim Bay to the Bering Strait. Our mission is to help our people speak with one voice to protect our ways of life. This is challenging today, because we are on the front lines of climate change, and there is great uncertainty about what the future holds and how it will affect the waters we depend upon. We have worked with tribal elders and regional leaders to express a common vision and we have traveled to Washington, D.C., numerous times to meet with decision-makers to ensure these waters can continue to provide for our needs and our children's future. This week, President Barack Obama responded by designating the Northern Bering Sea Climate Resilience Area. His landmark announcement is in response to requests made by coastal tribes, for action to prevent new stress on the ocean and to give tribes a meaningful seat at the table for future decision-making. To us, the northern Bering and strait region is a special place, a whole ecosystem driven by the rhythm of sea ice forming in the fall and retreating in the spring. Each part is connected to all other parts, and our long human history here accounts for the large territory Yup'ik and Inupiat peoples use for hunting and fishing. Here, every spring and fall, one of the Earth's great migrations occurs. We wait for it and prepare for it – walrus, whales, seals, and millions of birds and shellfish species – all moving past islands and along the coast. St. Lawrence Islanders call this Katawhsaqa, or "pouring out," because of the great abundance and movement of the animals. In Central Yup'ik, it is called Odagluten, meaning "moving to another place." But we are witnessing changes. Sea ice forms later now. Without shore-fast ice in the fall time, our villages are exposed to storm surges that erode the coastline and put entire villages in danger. There used to be ice floes coming through the Bering as the Chukchi Sea began to freeze up, carrying walruses and seals. But our northern hunters report that these floes rarely come anymore. We see that ice is thinner, making travel more dangerous. And during some recent years, the retreating ice drifted north so fast walrus hunters were completely unsuccessful. We asked Obama to help us. And he did. 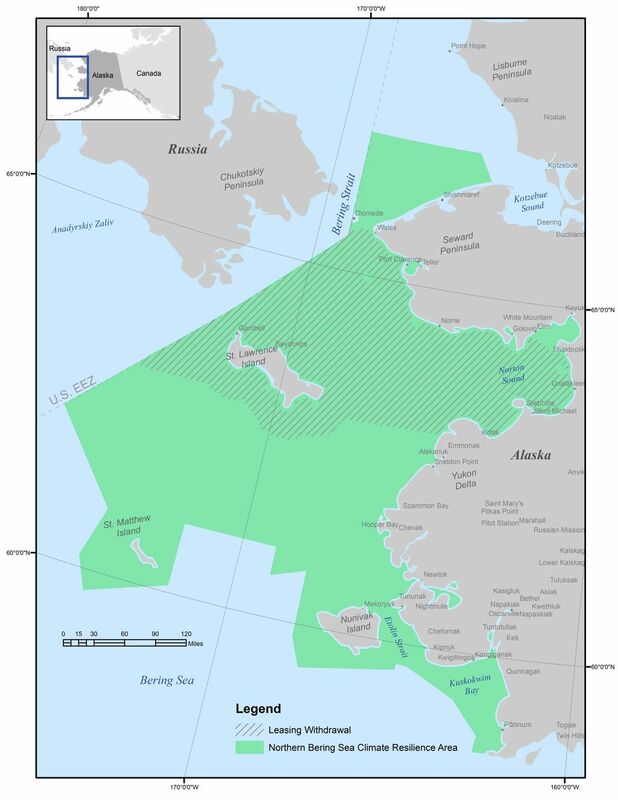 Tribes want to minimize risks associated with increasing ship traffic through the strait and throughout the Bering, as the loss of summer ice in the Arctic Ocean opens new global shipping routes. The president's executive order prohibits shipping companies operating in our waters from discharging polluting waste. It also reduces the risk from oil and gas drilling by withdrawing some of the region's waters from federal offshore leasing – something many villages have fought for since the 1980s. The executive order also establishes an advisory council, drawn from Alaska Native tribes, to work with federal agencies and better coordinate management in the region. This will make the federal government more accountable to tribes when decisions are made about shipping regulations and other marine management. We want to thank the president for recognizing the challenges we face in this climate-changing future. Hands down, Obama has done more for tribes than any other American president. He made an honorable commitment to listen, first. Then he took positive action to help our tribes prepare for a different future by protecting our culture, food security and the resilience of the ocean ecosystem that gives us life. That is the rich inheritance we pass on to our children. Harry Lincoln is the chairman of the Bering Sea Elders Group, an association of elders appointed by 39 participating tribes along the Yukon-Kuskokwim and Bering Strait coast. He has participated in the Tribal Nations Conference in Washington, D.C., and was an invited guest at a meeting on climate change for leaders of indigenous peoples, hosted by the White House in September 2016.